Google and film director Eliza McNitt have launched "Dot of Light," a new short documentary and exclusive smart phone case series, as inspired by history-making women astronauts. Imagine you could press a button on your smart phone case that would immediately connect you to trailblazing astronauts who would share their experiences of seeing Earth from above. Now, thanks to director Eliza McNitt and Google, you can do just that. 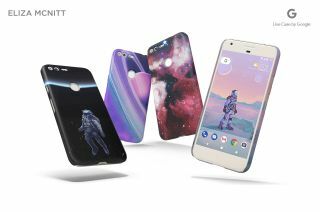 The emerging artist and technology company have teamed up to introduce a series of space exploration-inspired "Artworks Live Cases" for Google's Pixel phones, which at a push of a button launches "Dot of Light," a new short documentary by McNitt featuring women who made history in space. McNitt, whose earlier work has focused on merging virtual reality experiences with scientific discovery and an artistic narrative — notably, the Hubble Space Telescope-themed "A Fistful of Stars," which resulted in the largest community VR experience to date — has dreamt of that journey, too. She drew inspiration for "Dot of Light" and for the design of the live cases from the stories told by Kathy Sullivan, the first American woman to spacewalk; Nicole Stott, the first woman to paint while in space; and Anousheh Ansari, the first woman to privately-fund her own trip into space. "I was just captivated by their experiences and that simple human connection to our planet from above," McNitt told collectSPACE in an interview. "And what it's like to look out the window of the International Space Station and just how human space travel becomes." Sullivan, who until recently served as the administrator of NOAA (National Oceanic and Atmospheric Administration), logged 22 days on three flights into space, including on the mission to deploy the Hubble Space Telescope. Stott, who is now an accomplished artist herself, spent more than 100 days in Earth orbit as a space station crewmember. Ansari, whose family was the title sponsor for the original X Prize competition, became the first Iranian-American in space on her 11-day mission. In the ten-minute "Dot of Light," Ansari, Stott and Sullivan talk about how their own perspectives of space and Earth changed as a result of their vantage point from high above the planet. It was one of those stories, shared by Ansari at an earlier meeting with McNitt, which served as the theme for the entire project. "One thing that Anousheh said has always stuck in mind," said McNitt. "She was listening to her iPod and staring out the window and saw this thunderstorm below, but it looked like a light show. She thought it was so beautiful — but it struck her how there were people below probably stuck in the chaos and yet from above, it looked like this marvelous light show." "If anything, I would say that image inspired the cases and the creation of the film because I was so drawn to that idea of space through the eyes of these astronauts," she said. Film director Eliza McNitt interviews astronaut Kathy Sullivan, the first American woman to walk in space, for McNitt's short documentary, "Dot of Light," commissioned by Google. The case designs, which also drew from the experiences of astronauts Eileen Collins, the first woman to command a space crew, and Mae Jemison, the first African-American woman to fly into space, feature colorful images of planets, nebulas, rocket launches and explorers. "There is a case that we did of a spacewalk and the image is of someone free-floating. Kathy's reaction — she saw it and really loved it, but she laughed and said, 'They would have really been mad at me if I had a spacewalk without a tether!'" McNitt recalled, also laughing. Google debuted the documentary, which is free to watch on YouTube, and began sales of the live cases on Friday (May 5), the 56th anniversary of the first American human spaceflight, which is also National Space Day and National Astronaut Day. McNitt's nine case designs cost $40 each and are only available online from the Google Store in the U.S., Canada, Australia, United Kingdom and Germany. "I hope that this series reflects the accomplishments of all of these women astronauts. I think the story of the human exploration of space is a universal one and hopefully, the cases reflect a desire to venture to the stars," said McNitt. "Being able to make cases that represent that journey and then the journey beyond, to one day interstellar travel, was really exciting — to be able to reimagine the past that we know and then the future of space exploration," she said. Watch Eliza McNitt's "Dot of Light" documentary, featuring Kathy Sullivan, Nicole Stott and Anousheh Ansari, at collectSPACE.